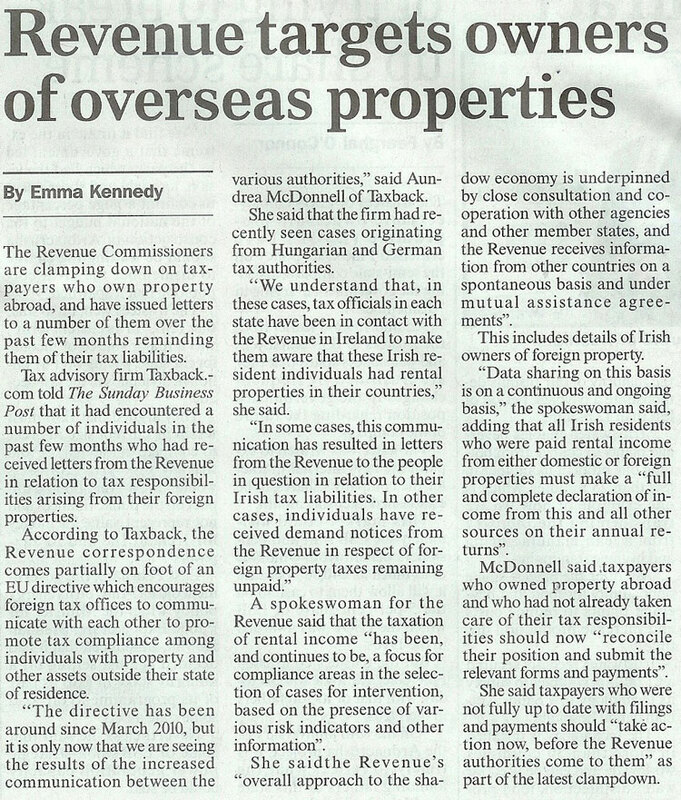 Overseas Property owners will probably have noticed that the Sunday Business Post (see below), the Irish Examiner and Irish Independent have all featured stories on the Irish Revenue’s ongoing attempts to recover payments it deems due from owners of property abroad. You’ll probably also have noted that all the articles are based on information provided by tax reclaim portal www.taxback.com. I’ve been asked by a number of people in relation to this matter how many Irish overseas property there are. In truth, I’ve seen quotes from 10’s of thousands to well over 100,000. I’ve no idea how the figures were reached or how accurate any of them are. There is, in fact, no way to accurately tell, even for the Revenue which probably has a better idea than anybody else. Contrary to popular opinion, you are not obliged to declare overseas assets unless they are providing an income, but you must declare any bank accounts you own overseas. Of course it’s virtually impossible to buy a property anywhere without owning a bank account in the country, hence the implied understanding that all overseas property owners must declare their assets abroad. In terms of the Revenue, actual ownership of property (or any other asset) abroad is largely irrelevant, all it is interested in is what income you have earned abroad on which you may be liable to pay tax and the genesis of the income used to purchase the asset. In fact, outside of holiday home owners, most investors abroad will have bought via companies in the country in question, so as far as the Revenue is concerned income is delivered to an Irish company or individual by a foreign company. It has no requirement to know what the company actually does to earn this income as this is entirely the jurisdiction of the country in which the company is owned. The problem for overseas property owners is that the power for co-operation between the tax authorities of, predominantly EU, countries have been increased significantly. The Irish Revenue was previously forced to engage in actively checking through overseas property registry offices to look for obvious Irish owners – a patently slow and frustrating process. In 2010 it was given the opportunity to co-operate with other EU tax authorities, who can now alert the Irish Revenue so that both authorities can liaise to ensure that both receive the tax they are owed on any particular income generating asset. This initiative, which is only now starting to bear fruit for the Revenue, gives it exponentially more power than heretofore when it comes to the quantity of Irish overseas property owners with undeclared income it can expect to unearth. A totally unquantified cadre of buyers overseas (predominantly active before the introduction of the Euro) purchased in order to take undeclared income from Ireland outside the jurisdiction. This is a sector in which the Revenue has long had a very strong interest – I actually did an article on this back in 2010 so it is far from a new phenomenon. The problem for most of these buyers in light of renewed co-operation, between EU tax authorities in particular, is that declaring the income at this stage would leave them with such an enormous tax bill that they are now stuck between a rock and a hard place. Not only will the Revenue expect to get tax, interest and penalties on any income derived from the asset, it will also expect the owner to accurately trace the money that was used to purchase the asset back to legitimate, taxed income in Ireland. This process may unearth undeclared income going back decades, resulting in very severe interest and penalty figures. This renewed push by the Revenue will come as a further crushing blow to overseas owners who, in many cases, are not paying taxes owed overseas because their circumstances have changed to the extent that they are not now in a position to pay further taxes and charges. These owners have also, in many cases, found that their overseas assets are now worth much less than the prices originally paid for them as many countries in which Irish citizens bought property have had property price crashes to varying degrees. Taxback.com says that the best approach for those with undeclared income abroad is to approach the Revenue voluntarily. In this instance, it claims, there may be the potential to mitigate interest and penalties somewhat, whereas if the initial approach comes from the Revenue there is very little opportunity for negotiation. You’ll find some brief guidelines from the Revenue on owning a foreign property and the tax consequences here.